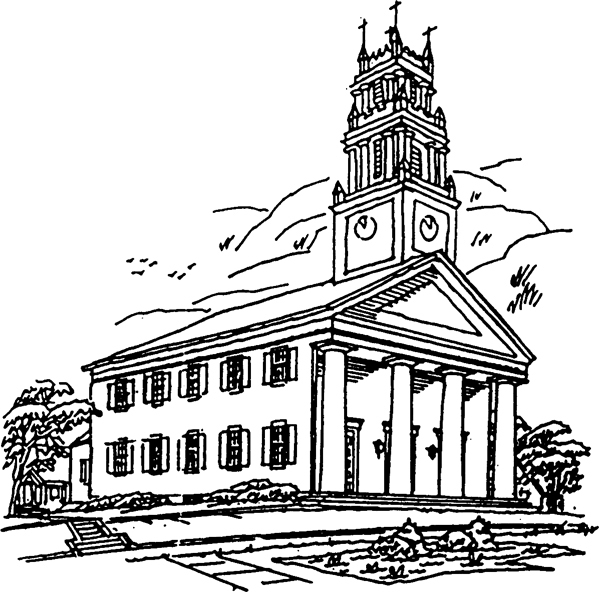 The First Congregational Church, originally called the Ecclesiastical Society of New Cambridge, was gathered in 1747. 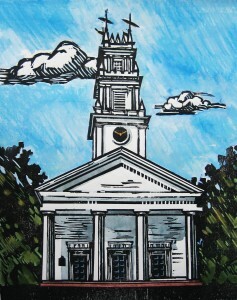 The first meetinghouse, built on the Green, was completed in 1753. A second meetinghouse was built twenty years later. The third and present meetinghouse was completed in 1832. In 1996, the sanctuary was renovated as part of the preparation for the celebration of the church’s 250th anniversary, which was held in 1997. Church School classes began in 1818 when with the separation of Church and State, ministers could no longer teach religious education in the public schools. In 1883, an addition was built on the south side of the church to accommodate the growing ministries of the congregation. This addition was torn down in 1910 to make way for the present Parish House, which was dedicated in 1914. The Lena Forbes Barnes Memorial Chapel was dedicated in 1951, adding another wonderful worship space to the church building as well as much needed classroom space. In the 1970’s, the basketball gym in the Parish House was converted into two floors, adding more classroom space. In 1960, church members voted to become affiliated with the United Church of Christ, a Protestant denomination formed in 1957 by the union of the Congregational Christian Churches and the Evangelical and Reformed Church. The Connecticut Conference of the UCC is made up of about 267 churches. Throughout the church’s history, the congregation has taken moments to pause and ask where God is calling this gathering of Christians. In 2010, a “Spirit” team was commissioned by the congregation to help the church community discern where the Holy Spirit was leading us. We continue to be guided by our call to welcome all in Christ’s love, nurture all in Christ’s love, and go forth to transform the world with Christ’s love. Following a successful capital campaign in 2015, FCC broke ground on the United in Ministry Safety and Accessibility renovation in the summer of 2016, which was finished in September 2017. The new atrium, back entrance with an accessibility ramp, elevator, and fire code stairwell welcome all people in Christ’s love.